The Royal Horticultural Society Encyclopedia of Conifers is a much needed reference book on conifer cultivars and species, both hardy and tropical. The two volumes of this extensive and lavishly illustrated 1,500-page work feature about 8,000 cultivars, over 5,000 photographs and all of the world’s 615 conifer species, plus their subspecies and varieties. High quality photos show general appearance of the plants, and in many cases detail special features. 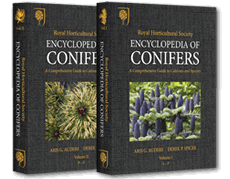 RHS Encyclopedia of Conifers – perfect addition to any professional as well as amateur gardener’s bookshelf.